It is our fifth time, we are old Fringers so to speak. We started in 2001, then 2004, 2015 and 2016. We started small, in a small venue in George Street and ended up in 2016 in the Grand selling over 16.000 tickets. Its being a long, tiring and rewarding journey. It is one of our best shows W have been performing INFINITA for 10 years now, but it is the first time that comes to Edinburgh. 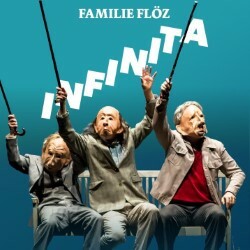 As all the other productions by Familie Floez is a collective creative process where all the actors participates and there is a director, an external eye so to speak, which coordinate all comes out from our improvisation. INFINITA is the third production of a company who came together in 1996 at the Folkwang Schule in Essen, at the time lead by Pina Bausch. We started in 4 people, we are now over 40, with 4 different companies touring at the same time 4 different productions. We love to visit the circus hub, or any of the international or circus shows… so many talented friends in the program!!!! Portrait in Motion for instance is a pearl!!! !